Your wedding is one of the most important days of your life, so lets us help you make it truly memorable. We enjoy designing flowers for each unique bride, with close attention to detail,we create individual bouquets for individual brides. Whether it is a quiet family wedding, or the social event of the year, we will create truly stunning flowers to transform your wedding into the dream come true. Here are a few of the bouquets Fiona has made for her brides. To see more go to the gallery or phone Fiona for an appointment to see her album of designs. 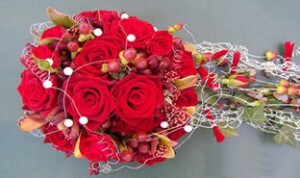 A modern twist on a cascade bouquet using a hand tied of Red Rose and berries. The Cascade is made of designer wire, beads and small roses to link with the brides dress. A variation of a hand tied bouquet, the roses are hugged with sissal to bring in the colour of the wedding party. 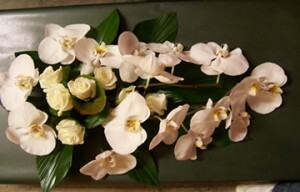 Beautiful phalaenopsis orchids in a timeless shower bouquet. Classic mix of Ivory roses – always gorgeous! Beautiful pink roses encased in a decorative wire cup with a cerise pink orchid on top, completed with a dreamy cascade of ribbons from the handle. A truly elegant bouquet in creamy white flowers including lily of the valley which adds its delicate fragrance to this sophisticated bouquet. Cascade of Ivory calla lilies with bear grass and a few beads to catch the light! Gent’s calla buttonhole decorated with wire to match bride’s bouquet. Designer buttonhole can be made in any colour to match colour theme of wedding! If you would like to see more of our Wedding Arrangements go to our Gallery.